1.) Laurie Blau-Marshall and I shared a locker in high school and we decorated it (yes, even waaaaay back then) in rainbows. Awwww, how cute is that? 2.) I have lived in Washington, California, and Missouri, and never felt an earthquake, never seen a tornado, but did see a volcano (MT St. Helens) erupt. 3) I am a compulsive vacuumer. My husband says I wear them out before their time-lol! Now I will tag Laurie Blau-Marshall, Suzan Buckner, Michelle Dobell, and Sherry Smyth! 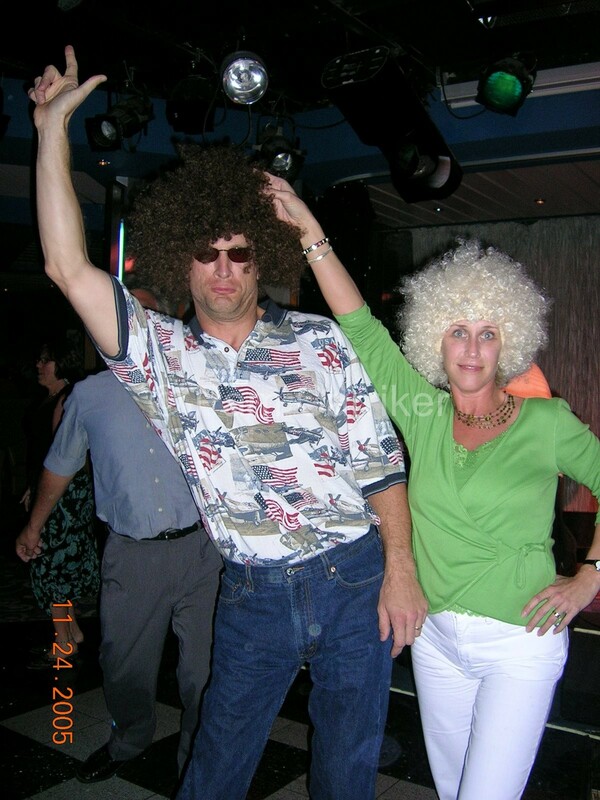 Oh, yeah the pic is my salute to the 80’s after reading a post on Sherry’s blog-lol! Hubby and I go retro on a cruise:-) I hope they let us back on the ship because we get to set sail again in a couple of weeks-woo-hoo! How fun-lol 🙂 Love the pic and I,too, love reading fun facts about my blog friends! Too funny! I love that picture. I’m jealous you are going on another cruise lol… have fun. I love this tag game cuz it gives us yet another insite to some wonderful, talented people we call friends here!!! I for one thing you looked great in that wig..eheheh!!! Fun times..
lol…the photograph is fab…BUT…you got to take that hair OFF girlfriend…I had to wait until that horrible perm grew out!!! too funny!! !Thanks for the tag…I’ll let you know when it’s up!